The number of high frequency, high power applications is rapidly increasing each year. The need for resistors with both high frequency performance and high power handling capability is growing. In most cases, the smaller the resistor, the better it will perform at high frequencies. At the same time, the larger the resistor, the better the thermal properties are. Many designers are making compromises when both power and performance matter. IMS has solved this dilemma with an innovative resistor that offers the best of both worlds called a SZG style termination device. Thermal management is becoming much more important as the density of electronic components and the applied power increases. Both factors lead to higher temperatures produced by not only the individual components, but also the entire assembly. Heat dissipation in high power electronics creates challenges for integrating material selection together with thermal designs. As a result of the power and signal combinations running through resistors, heat is generated. When more power is applied to a resistor, more heat is generated. If this heat is not properly transferred out of the part, the heat build-up can cause the part to shift in value and eventually fail electrically and mechanically. When a company claims extremely high power levels in advertisements and data sheets, that designer must maintain certain criteria. Maximum surface or baseplate temperatures (often these are typically listed in the “fine print”) is a common example. The IMS termination NDR-2010 SZG has a power rating of 150Watts with a baseplate temperature of 50°C. The devices themselves are capable of running at these power ratings due to the higher thermal conductivity of the substrate and the ability to quickly and efficiently transfer the heat away from the device. The challenge is where that heat gets transferred. The following are techniques to manage this thermal energy generated by high-power surface-mount resistors. Electrical Test Equipment Hire can be a great way to check the voltage and current of your circuit is healthy so there are no power cuts. 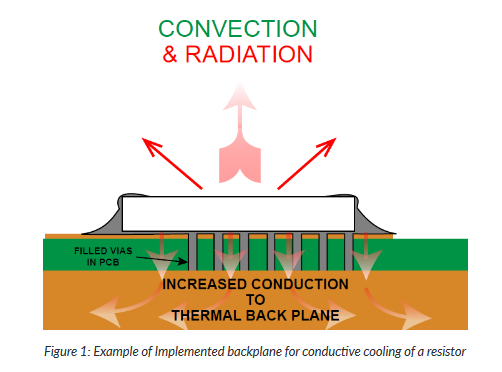 One technique is to employ a thermal back-plane. This technique uses a larger copper plate on the backside of the board to transfer the heat away from the circuit. The heat is spread over a large thermal mass, which will increase the area to transfer heat by convection, conduction and/or radiation. Note that if active thermal management is not employed, the board and surrounding environment may succumb to the heat and exceed safe operating temperatures. To take the power handling one step further, IMS has implemented a “scrub-cut” rather than the traditional L-cut when the resistor is being laser trimmed to the required tolerance. The scrub-cut runs parallel with the tapered resistor meaning there is no current crowding or hot spots along the resistive element. Figure 2 shows images of the current densities on the same component. The left image has a L trim while the image on the right has a scrub/scan trim. You can see by the color that there is much more current density in the L cut resulting in a hot spot while there is almost no current crowding in the scrub cut image. The SZG resistor uses a tapered resistor body with a smaller input pad. Making the input side narrower improves VSWR at higher frequencies. The resistor then expands to a larger cross section to optimize heat dissipation and maintain VSWR matching. Of course, the actual impedance match is a combination of the customer input line width and the customer’s substrate materials, and how they interact with the component. The wider trace also lowers the high frequency impedance linearly due to the taper. The increasing capacitance of the wider trace lowers the impedance as you move towards the back end of the part which is connected to ground and therefore zero ohms. So the taper takes the 50? input, and starts transitioning the impedance towards the output end of zero ohms. Compared to the standard SG the SZG has a drafted resistor body to minimize input termination width differences from the trace. The SZG uses a “Scan-Cut” or edge-trim for tuning to a 2% tolerance. The scan-cut improves performance for high power or pulsed power and it reduces stress concentrations or heat concentrations do to current crowding. For applications where footprint can be customized and both power and frequency performance must be optimal, changing the resistor to be wider than the distance between the terminals can offer a benefit. This configuration is called “reverse aspect” due to the fact the overall component is very wide and very short in similar proportions to traditional case sizes, but in reverse. A 2512 case size may appear as a “1225” in this configuration. A visual comparison is shown in Figure 6 to illustrate the approximate configuration of two similar sizes components. By changing the aspect ratio on the resistor the “term to term” distance is shortened giving the component a better frequency response at higher frequencies. In most cases the surface area of the resistor body will not vary. This preserves the potential heat dissipation of the design so that the power handling is not altered by a large degree, while taking advantage of the frequency performance enhancement. 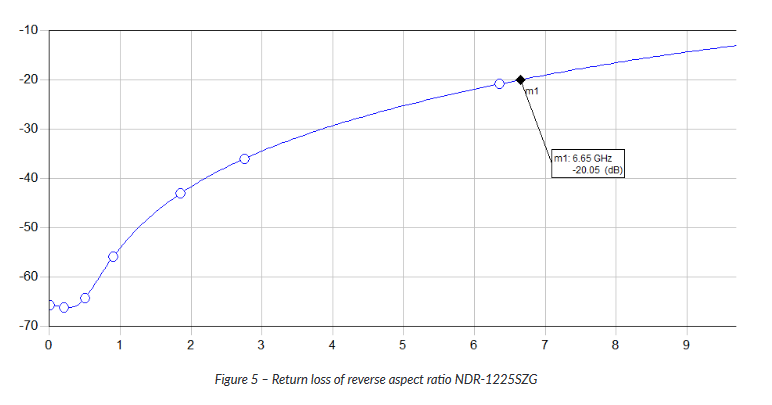 For example, the N-series 1020 SZG has 91.8% of the resistive element surface area of the N-series 2010 SZG component. This translates to nearly identical thermal heat transfer performance which ensures the power ratings are very close. The reverse aspect ratio style of resistor also features more metallized terminal surface area and resistor-termination interface area. This only helps to normalize the heat transfer across the entire resistor substrate body to the heat sinking of the circuit board. These conditions improve frequency response and thermal performance, enabling a better performing component with equivalent power capabilities in the same footprint. The SZG style resistor gives us a better frequency response than components with the same footprint with thermal properties equivalent to the same size package. Custom designs are available but standard packages are readily available for 1206-3725 with the SZG termination. When looking for a high power, high frequency resistor without compromises, N-series SZG is recommended and successfully deployed in today’s hi-tech applications. Take a look at our whitepaper to learn more about SZG terminations. Please contact the experts at IMS to discuss your application in greater detail.